Can Kristin Kreuk Live Up to Chun Li? Can the beautiful Kristin Kreuk live up to the Legend of Chun Li? She certainly doesn't have Chun Li's thighs but Kristin's other attributes make up for that. We are hoping that Street Fighter: The Legend of Chun Li is at least a good movie. Glancing through this list, it’s not hard to read what’s on my mind: Killzone 2 and Street Fighter IV. I’ve been having an amazing time all week playing SFIV with friends either in person or via the chat-enhanced magic of PSN. Pretty good week for the PSP, huh? But before you’ll get your hands on LittleBigPlanet for PSP, or Assassin’s Creed, or MotorStorm: Arctic Edge… this is one of the games that’s going to be keeping you busy - Resistance: Retribution. Back by popular demand (and we do mean “demand”), Guerrilla Games will be staying up late in Amsterdam this coming Wednesday, February 25th, to participate in a second in-Blog live chat & sharing more info on Killzone 2. I�m Mark Stanley, Director and General Manager for Latin America at SCEA. I�m thrilled to announce that today PlayStation is officially expanding into Latin America! More exclusive new inFamous info is on the way�tune in to Spike tonight at 1 a.m. PT/ET for inside access to inFamous with GameTrailers TV as host Geoff Keighley goes on-site at Sucker Punch�s studio in Bellevue, WA. Sign in with your amazon.com account. Use coupon code MAPNEWNCSAVE and get $10 CAD off. 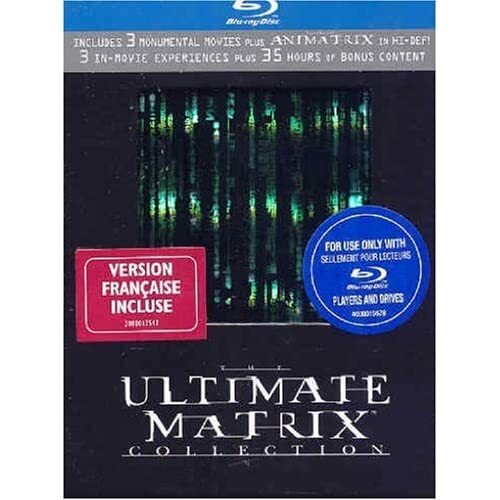 Check out and wait for The Ultimate Matrix Collection on blu-ray from Canada for $42 shipped. It is currently $75 from amazon.com. $33 savings for your next game. Hi everyone. Here’s your weekly update of the new movies and TV shows available on PlayStation Network. Have a great weekend! Hello all, my name is Patrick Hager, I�m the lead graphics programmer and I�m here to fill in some more info on lighting in MLB 09 The Show. Warning: Helghast Invasion of Home imminent	— Helghast soldiers roaming around Home and dispensing Killzone 2 demo codes. Anyone get a voucher? LocoRoco 2 Review Roundup	— The reviews are in. LocoRoco 2 delivers another cute uppercut. Humbled, Honored and Hooray�ing all day!!! LittleBigPlanet AIAS awards recap! It’s week two of the �PSN Spring Fever� section of the PlayStation Store, featuring games, trailers, and themes available for download! Headlining this week are Zuma and Noby Noby Boy! 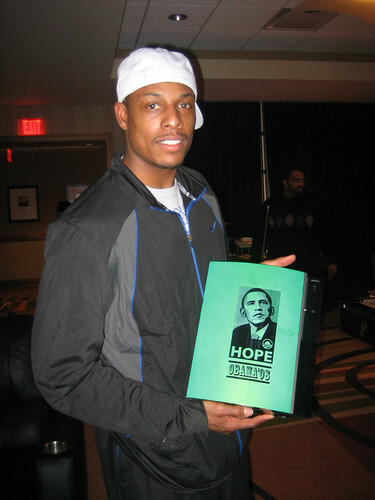 Here is Paul Pierce of the Boston Celtics showing off his custom Celtic green Obama "Hope" PlayStation 3. He received it during last weekend's NBA All-Star Weekend. We're not sure who these NBA players are. If you have a guess, post them up. It�s TJ from the Marketing team (again). We�re at T-minus 10 days until Killzone 2 hits the PLAYSTATION 3 & we figured we�d get you up to speed on Killzone.com. Go inside the Street Fighter IV Launch! I know, due to challenges coming in to me via Facebook and IM, that Street Fighter IV hits the… er… street today. In the upcoming (just 12 days away!) Killzone 2, the ISA forces lead an assault of the planet Helghan. But that doesn’t mean the Helghast are on the defensive. In fact, my intel tells me that the Helghast forces are en route to PlayStation Home today. The new LocoRoco 2 Planet theme for both PSP and PS3! Yes, okay, I admit, that was pretty pathetic. However, I would like to share how excited we are on how LocoRoco 2 was reviewed this week! This past weekend, Sony partnered up with the NBA to outfit the official player�s lounge at NBA All-Star weekend, giving players and families a chance to relax, play some of the latest PlayStation games, and get access to one-of-a-kind, customized Nike Air Force Ones and a PLAYSTATION 3 laser-etched with a design of their choice. Hey folks, Jason Villa (Producer) here to let you know about a new feature to look out for in MLB 09 The Show. I�ll be explaining the details of the new Roster Vault feature for the PLAYSTATION 3 version of MLB 09. Get in the spring spirit with the new �PSN Spring Fever� section of the PlayStation Store featuring games, trailers, and themes available for download with the launch of Flower today! A lot of interesting stories to read in the last week, not the least of which involve the God of War III Media preview. Many more have been written than the 3 I linked to here - but I think it’ll give you the gist, Kratos is getting up to something special (again!). 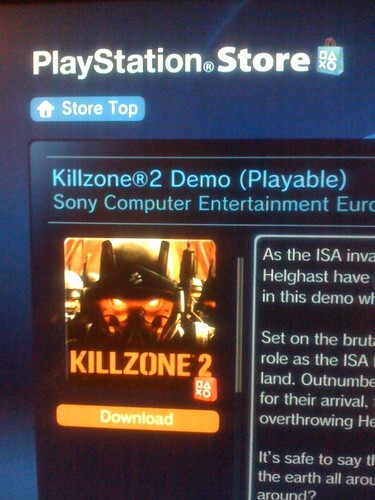 A quick video walkthrough of the Killzone 2 Demo available on the European store or for those that pre-ordered in the US. KZ2 will be available on February 27. Hey everyone, Ramone Russell here, Community Manager for the SCEA San Diego Studios. Last Thursday and Friday marked the first time we here at SCEA opened the doors of the studio to the general public. We decided to do this for a multitude of reasons, some not as obvious as others. God of War III is �D-Day + Cloverfield with Kratos smack dab in the middle of it� � Stig Asmussen, Game Director. Collect Intel in Killzone 2, Get Rewards on Killzone.com — Collect Helghast intel in Killzone 2’s single-player campaign to earn special rewards from Killzone.com. Burnout Paradise - the Party Pack! — Criterion releases the first premium content pack for Burnout Paradise. 8-player pass-the-pad single-screen action. Lumines Classic Pack Coming Today, Celebrates 4 Years of Block-puzzling Fun! Welcome to another update on the world of LBP. ‘Failed to save profile’ message not being displayed when a user’s profile is full. It�s Victor Zuylen from Killzone.com here. With Killzone 2 receiving lots of positive attention from the press, I figured now would be a good time to give you a taste of the bonus content which can be unlocked on Killzone.com through the game. The following is an important public service announcement for all PlayStation baseball fans: THE PS3 PRE-RELEASE DOWNLOADABLE DEMO FOR MLB 09 THE SHOW IS NOW AVAILABLE ON PSN. If you are a baseball fan, you are strongly advised to drop everything and initiate the download. We now return you to the regularly scheduled programming. Resident Evil 5 demo live on PSN today	— What do you think of the new controls? Any luck against that Executioner? Hi again! The weekend�s almost here, and that means it�s time for your weekly update of new movie & TV shows on the PlayStation Network. Yes, it�s that time of year again, Valentines Day. Whether you love it or loathe it, everyone can relate to the typical candies, flowers and cards that get�s passed around year after year, after year� what�s the fun in that? The Punisher: No Mercy, Exclusively on PSN this Spring! Hey everybody. My name is Eddy Cramm (Senior Designer), and it�s my turn to bring you MLB 09 The Show blog #3�or #4�maybe #5. Not really sure which one we are on. Bear with me, we are all working some long hours right now getting this game polished and out the door! In a world of public apologies, consider this my big fat sack-sized “I’m Sorry!”. Pre-order Killzone 2 at GameStop, Play the Demo Now! It’s TJ from the Marketing Team, back again for another update on Killzone 2. A ton of Killzone 2 reviews have posted & the game is already receiving critical acclaim, including 5 Editor’s Choice awards from various media. The February episode of Qore�s got variety and new technology. 3 on 3 NHL Arcade Coming to PSN Tomorrow! Click on this 80gb Sony PS3 link. Checkout and add this coupon code: 138BFW5PN676V2. The code is good for 20% off a PlayStation 3. Tax and shipping may apply. 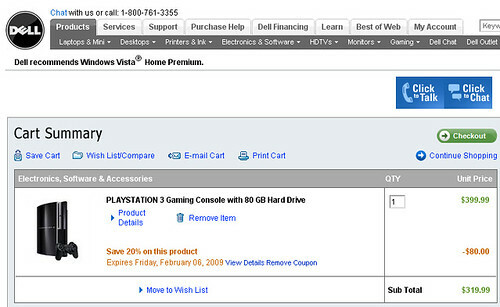 Continue the checkout process and enjoy your new PS3. Hey there, PlayStation.Blog reader! You may have noticed the addition of Chris Morell to our staff in December. If not, I encourage you to head over to his Flower interview and giggle at the freeze-frame there. It’s OK, I’ll wait. There, wasn’t that worth it? Happy Lunar New Year from LittleBigPlanet, Plus a Special Video from Media Molecule! — Limited Chinese New Year getups, plus a Media Molecule video recipe for creating your own awesome Survival Challenge. Hi again! The weekend�s almost here. It�s time for your weekly update of new movie & TV shows on the PlayStation Network. LocoRoco 2: Spreading the Loco-Love with Free PlayStation Store Goodies! Sure, it’s Super Bowl Sunday. But if you’re not a football fan, a reader outside of the US, or just a bitter, still-not-over-it Eagles fan like myself who can’t bear to watch the game this year - here’s something to look forward to for tomorrow: Killzone 2 reviews.